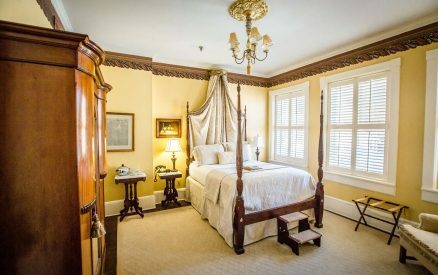 Very private accommodation at our romantic Savannah luxury hotel! Windows across the back of the guest room, with treetop views toward Wright Square. 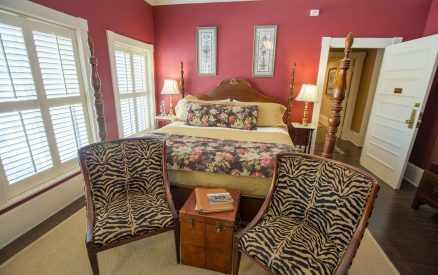 This beautiful room at our romantic Savannah hotel has sophisticated, warm tones. The queen mahogany rice-carved bed with a beautiful, ornate gold corona and warm-tone damask fabric matching perfectly with bedding by Anichini. True old world elegance with English mahogany armoire adds a touch of elegance. Two comfortable wing back chairs allow you to relax. Cool and comfortable as a Georgia peach! Includes a new flat-screen TV. A wonderful view of windows across the back unto Wright Square! 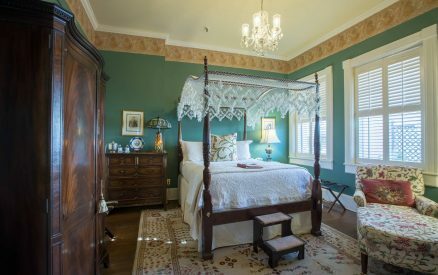 Sophisticated green hues are a highlight of this accommodation at our Boutique Inn in Savannah Georgia, with its queen-size, rice-carved canopied bed and imported Italian cream matelasse coverlet, plushy Euro shams, and crewel and silk pillows.